62, 92 & 92" x 102", 8500hp @ 30rpm by Detroit Shipbuilding Co., Detroit, MI. 14'8" x 23' & 160# steam forced draft scotch boilers. Feathering paddle wheeels 31'6" with 11 paddles 14'6" 5'. 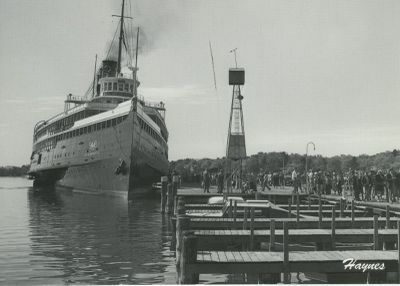 Designed by Frank E. Kirby; largest sidewheel steamer in the world. 1911, Oct 7 Launched; 600 staterooms; speed of 23mph. 1912, May 30 Trial run; Collision with JOSEPH C. SUIT, sinking her on Detroit River. 1912, Jun 26 Maiden trip Detroit - Buffalo. 1924 Detroit - Cleveland route. 1928 Grounded, mouth of Detroit River.